As private jets get increasingly popular, more and more people are talking about them. While that’s great in itself, it also means there are more misconceptions about the industry than ever before. So just what false impressions do people have? 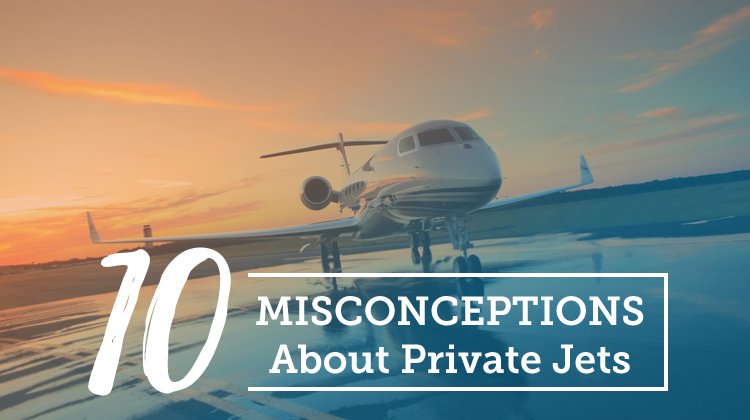 We’ll take a look at some of the most common misconceptions that your clients may have heard about private jets, and why they’re complete nonsense! They’re not safe: This has been an ongoing concern for a while, and can be a deal-breaker for many. People tend to assume that because the statistics show that private jets crash more often than public airliners, it must mean that they’re not as safe. But people generally fail to realize that over 95% of these crashes are either due to the pilot making a mistake, general negligence, or poor maintenance of the jet. In other words, if these preventable causes are checked, then a private jet is as safe, if not safer, than a public airliner. Only billionaires can afford them: Again, this simply isn’t true. The idea that private jets are exclusively for billionaires has been floating around for a while now, which makes it pretty hard to change people’s minds. While jets are multimillion dollar pieces of machinery that cost a fair amount to maintain, they’re by no means exclusively for billionaires. They’re expensive: Yes, private jets can be expensive, but private jet charters are far more reasonable than most people might think. There are now some really affordable ways to enjoy flying privately. They’re not that different from first class: It’s funny that a lot of the people who say this have never flown first class, let alone in a private jet. As anyone who’s flown privately before will tell you, it’s also just not true. First, the fact that it’s a “private” jet tells you a lot about the experience. You have priceless privacy, loads of space, and an entirely new level of luxurious comfort. They can’t travel long distances: This misconception is also quite simply not true. People just assume that what the jet gains in speed, it loses in distance covered. They develop problems easily: Everything can develop problems with time, especially if they’re not properly maintained. Yes, private jets can develop problems like everything else, but it’s a complete lie that they have a higher share of problems. They’re overrated: Again, it’s funny that this appears to be said by people who’ve never flown privately. It couldn’t be further from the truth; if anything, the awesome feeling of flying privately is underrated! You need to pay for the full plane: Well, you can if you’ve got the money. But if you don’t have the cash ready, you can easily get a private jet through leases and loans if you have suitable credit. They’re just not worth it: From being able to make quick journeys for time-sensitive events to the fact that you won’t have to deal with flight cancellations or any of the other annoyances of flying publically, it’s very much worth it. While the above are some clearly incorrect (and painfully common) misconceptions, it’s important that they’re addressed so the private jet charter business can continue to flourish.